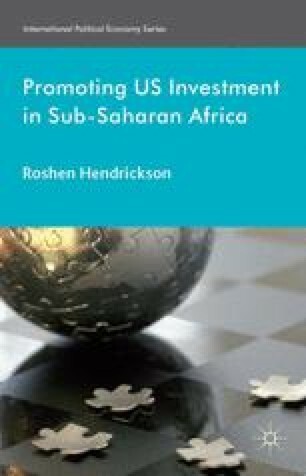 Since their earliest forays into the African continent, in pursuit of economic opportunities, Americans have argued that they should have the same ‘rights’ of access that other foreign actors have, and that their economic engagement is inherently progressive. From the earliest involvement, private business actors have sought greater government support to compete with other countries. In addition to direct support for businesses to help them mitigate the risks of investing in Africa, government institutions have played a very significant role in shaping the environment for investment in African countries. Activist groups have also organized at the domestic and international levels, to challenge investment practices and seek adjustments in the nature of this particular foreign economic activity. Now the influence of the US government, through both bilateral and multilateral mechanisms, is moderated by the rise in power of emerging economies but also by the multiplicity of increasingly influential actors (in addition to MNCs and NGOs) such as diaspora networks, charitable foundations, sovereign wealth funds (SWFs), and venture capital funds.